Here are the Official Voting Results of the Big Brother Naija 2018 ‘Season 3’ Grand Finale week. 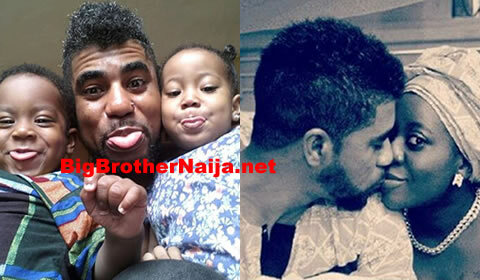 This week being the final one of Big Brother Naija Season 3, the amount of total votes cast increased to an overall total of over 30 million votes. 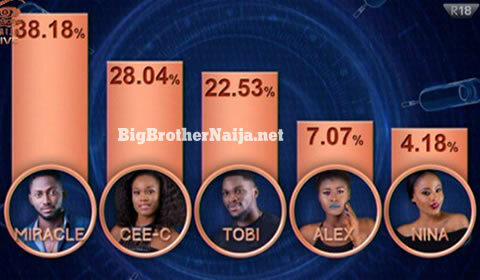 The voting results indicate that Miracle came in first position after receiving the highest percentage of votes, he was followed by Cee-C is second position, Tobi Bakre came in third position, Alex came in fourth position while Nina came in fifth position after receiving the least percentage of votes. Congratulations to Miracle on winning BBNaija 2018, I'm also happy for Cee-C because she put up a strong competition. I also want to thank Biggie for the show and I'm really going to miss everything about this show. Goodbye Biggie and the housemates. Congratulations to my guy Miracle, it was clear from the onset that he is going to occupy the throne. I hope we see the Bigbrother session again soon please. I AM SO ATTACHED to the programme that a day would not go by without me watching.please bring it back soon please. i don't care whether its bigbrothernaija or africa or sa, as long as its bbn. I fell in love with Naija to an extend that I love Naija music and dance with all my heart. Farewell biggy. you have done a good job. Congratulations to my own Miraculous miracle. So proud of him. MIRACLE AND NINA WE LOVE YOU VERY MUCH KEEP YOUR LOVE GOING BABE'S SOUTH AFRICA LOVE YOU . Congratulations to Miracle you play very good you and Nina we which you all the best both two of you Iam praying to be together Mira you did Love Nina and Nina also Love you. so lets keep every thing to god hands .we love you both of you THANK YOU BIG BROTHER SOUTH AFRICA LOVE YOU VERY MUCH THIS IS NICE BIG BROTHER EVER IN MY LIFE .THANK YOU THANK YOU AGAIN .